Eldorado 1400, wife's bike but I get to work on it. Hello to all! Ray here! 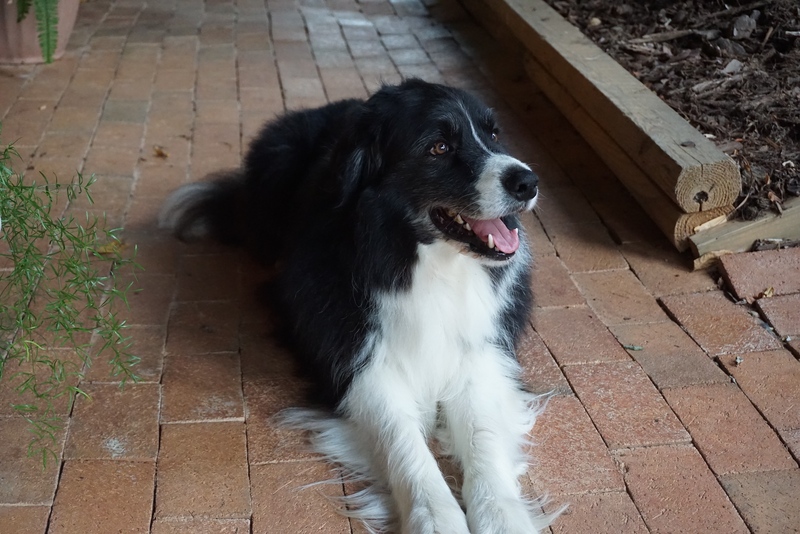 Aka Ringosdad (Ringo is my Australian shepherd) and he is dads boy make no mistake! I'm gonna be purchasing a norge soon! I've owned a breva in the past. He's a good looker! Thanks to jack! im always happy to run into dog lovers! 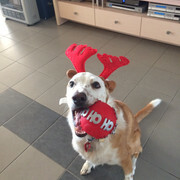 My daughter has made him look like a bit of a clown but he is very intelligent and will do almost anything for a doggy biscuit. My name is Neal Pritchard. I'm 60 and am the owner of a 2000 V11 Bassa. I'm trying to learn how to work on Fuel Injection. I also own a 1948 Indian Cheif. I live in Corning New York. Welcome Neal, this may help you understand the system, even though you may have the 15M ecu. It is still the same. Long time lurker now new member. 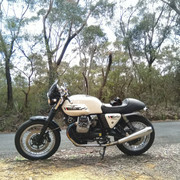 I ride a V7 Café Classic. I've made quite a few mainly cosmetic mods to it. I know the V7 isn't a lot of people's favourite bike but it's perfect for me for quick jaunts out of the city and even touring. I'm a little sad I let my '10 Café Classic go, but the V7III Carbon is a much more modern ride. BTW: I found a tin sign on Amazon, delivered from China that would look great hung behind your bike in the garage. I've never ridden a single throttle body but I've heard that they're a bit quicker. I don't think I could part with mine anyway. I'm not very good at breaking up. Besides, with all the mods, I've got it pretty much exactly how I want it. Hi, I'm Matt. 54y.o. Software developer. Live in New Zealand. Had my beloved 1994 California 1100 since 2002 and done all the mechanics on it. Welcome. My son is a computer engineer in New Zealand. Been there 2 1/2 years now. Hi Matt. Welcome. Where are you based? Lucky dog you! We have some big time 'vert experts here. I'm more of a LeMans kinda guy myself. You live in a BEATIFUL State! Hi, I’m Dirk! Illustrator, roller derby referee, roommate of two cats, Petro and Ambassador Doombringer. Moved to Coastal New Hampshire from York, PA April of 2016. Got into motorcycles in 2011. Previously owned a ‘77 Kawasaki KZ400, Honda CX500, Suzuki TU250X. Prefer air-cooled naked standards over anything else - I dig the versatility and simplicity. Own a V7 II Stone that I bought January 2017. 16k miles on it so far. 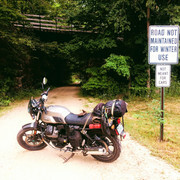 Try to ride throughout the year when ice and snow aren’t covering the road! 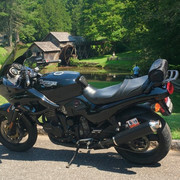 Been to Nova Scotia, New Brunswick, Montreal, Quebec, and across Pennsylvania on the bike. Did a 3-week moto trip through Andalusia, Spain in 2017, (on a BMW F650 GS); doing another 3-week trip through Turkey at the end of this summer. 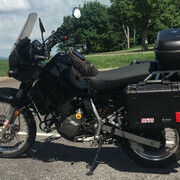 Still enjoy camping, outdoor activities in general, and of course, motorcycles. 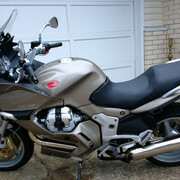 HI i am a Guzzi rider from Milwaukee!! I have a 14 v7 racer that i am thinking about modding. Hello Alex here, 62 years young, landscape contractor with a mechanical engineering background. Have been riding since just a little kid on a mini bike, raced Motocross professionally in my twenties, did some road racing & track days later in life. Never ever remember not having a motorcycle. Current bikes, Ktm 1290r, Ktm 300 2 stroke, 2 Ducati Hypermotards, 3 Victorys, Yamaha RZ 350, Suzuki gt750 2 stroke Water buffalo & now my 1st Motoguzzi the 2017 (new) Mgx-21 Flying fortress. I live in West Covina Ca. 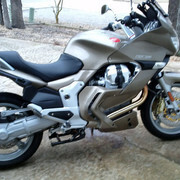 Im hoping to hook up with some of you Guzzi guys for a ride soon. There are some close local rallies you might like. NM, AZ and Sandy Eggo. Welcome fellas , don't be shy . another new list member here. 47 years on motorized 2 wheels. 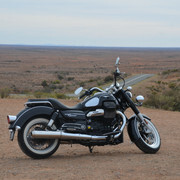 My first Guzzi was a used v65 maybe 15 years ago, than went through a several adventure bikes. Just moved 1000 miles south of PA to the land of straight roads and bought another cruiser. Blue 2017 V7 III Special. I forgot how much cruisers were, can't stop smiling riding this thing. Axel from Brussels, Belgium here. I'm 38 and already owned 6 motorycles including 4 Guzzi's. 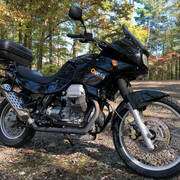 New to me 2009 Norge purchased from Private Owner with 6,140 miles. Location: Bull Shoals, AR home of some of the most beautiful mountain roads in the world. Interests motorcycles, cars, working out, yoga, kick boxing and women. Not neccesarily in that order.